After a comprehensive site visit and providing the quotation to the CEO, Peter Webster, Solargain was asked to personally present the submission to a council meeting and be available to answer questions. As a result of ensuring that the representatives of the council felt comfortable with what was being proposed, and our ability to provide a high quality solution, Solargain was chosen as the winning bidder for this project. 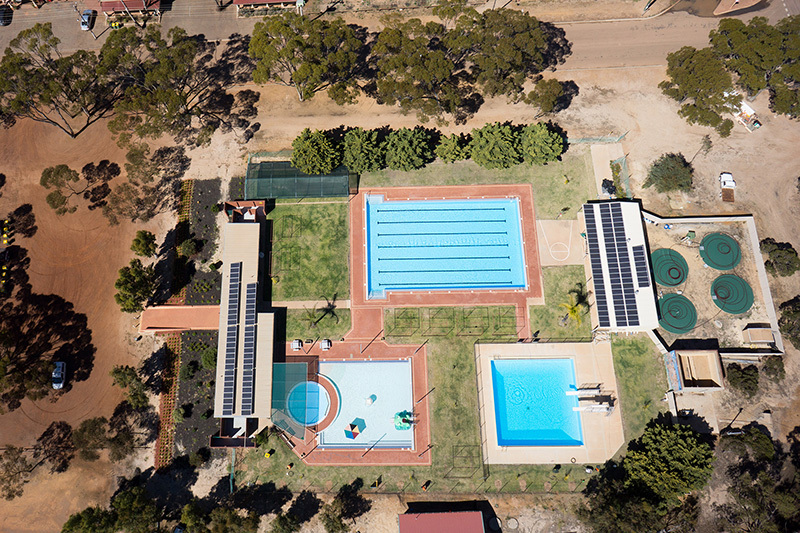 An important factor in their decision, was that the Hyden Swimming Pool is a public facility which was operational at the time Solargain was conducting the system installation. Solargain’s ISO 9001 and AS/ANZ 4801 accreditations, and resulting adherence to policies and procedures, made the council feel comfortable that our systems ensured the best chance of the installation proceeding without incident. As shown in the photo above, the system is split among two buildings - the original entrance and change rooms at the front of the facility, and the new storage shed installed at the rear of the property. Since installation, the system has made a significant impact on the operating expenses related to running the facility, and provides a hedge against the rising cost of energy for years to come.